Also, deep learning would definitely prove to be an essential component to create truly intelligent machines but probably not enough alone. By Raksham Pandey, KDnuggets Contributor. As an amazing course on AGI at MIT by one of my favourite lecturers ( @lexfridman ) is about to begin (or might already have kicked off by the time this article is posted), I felt like writing about the very same topic that I have been reading for quite a few months now. "Almost all young people working on Artificial Intelligence look around and say - What's popular? Statistical learning. So I'll do that. That's exactly the way to kill yourself scientifically." - Marvin Minsky during his course called Society of Mind at MIT in 2011. Marvin Minsky, the famous American cognitive scientist and co-founder of MIT’s AI Laboratory, never agreed for a way too simple approach towards AGI or replicating functionality of brain for that matter. But we still can’t deny the progress deep learning has brought about in the field. There could be high chances that the brain does not do gradient descent and stuff but it’s unfair to undermine deep learning on the basis of that. There are many things about the brain that we don’t possess while creating a replica of it. Also, deep learning would definitely prove to be an essential component to create truly intelligent machines but probably not enough alone. It can be stated that the core idea behind the work of Ben Goertzel is something the vast majority of curious minds would’ve thought of long back; programatically designing organs as components of AGI to create intelligence close to that of humans if not at par with them, by using the concept of cognitive synergy. But no one really was able to bring this thought to reality... He did. With its fair share of flaws and probably also not enough funding that is available with tech giants like Google, Facebook and Tesla, OpenCog’s contribution towards creating AGI can simply not be ignored at any cost. Guess what? Even Ben’s work uses deep learning! There are numerous reasons why deep learning cannot be done away with. There is a need to rethink backpropagation as said by Geoff Hinton himself, but no one can deny that it has been a huge success. Maybe someone will come up with an even more sensible alternative for deep learning and backpropagation in particular, due to its use in a plethora of applications. ii) Watch the movie very soon! I vividly remember the scene where Ava is running towards her (not using 'it' for Ava with the positive hope that we’ll have human-like AI in the future and would have to use suitable pronouns for them) own creator Nathan to kill him. It does send chills through the viewer’s body. Such things have been shown time and time again in various sci-fi movies and also been supported by very well known people in the field who are warning us about AI. What if our creations become the cause of our death? This brings up the need to include coexistence and ‘benevolence’ in the robots so that they don’t fear us. But then again, there have been strong claims that AI today hasn’t even reached the level of intelligence of a mouse. I believe a lot in Ben Goertzel’s idea of the need for cognitive synergy. What’s that? It is the combination of different components designed to be intelligent to form a cognitive system wherein they will help each other out to perform their respective tasks for the system to be capable of being called truly intelligent irrespective of whether it has faced a particular situation in the real world before or not. Yes, maybe good computation power would be needed but then that’s required everywhere; the more, the better. One might take the example of transfer learning wherein just the last few layers are changed and trained whereas most part of the model remains the same. One could also imagine using this for several tasks that would need prediction. Based on the requirement of the system, a model could be trained to learn which situation needs what type of last layers to be used for successful completion of the task with efficiency more than that of humans (because if not, then umm... what’s the point? 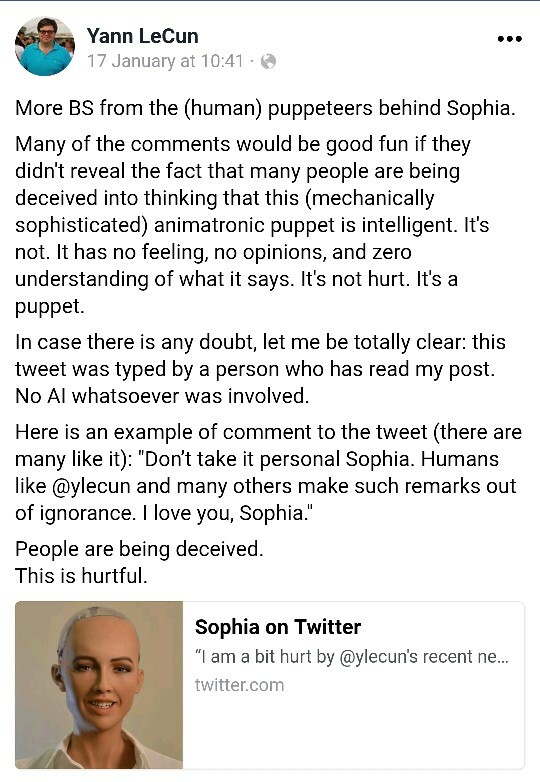 I obviously cannot vouch for how real Sophia actually is, how close to intelligence is this Twitter using robot, and how many of its functions is it actually performing and not someone from the developers team but I do genuinely appreciate the idea and the effort put in to implement it irrespective of the end product and its viability. While Gary brought up certain very interesting points for everyone to think about, there are moments when they start seeming extreme. The Facebook AI Director on the other hand was very calm and tackled all arguments very sensibly. 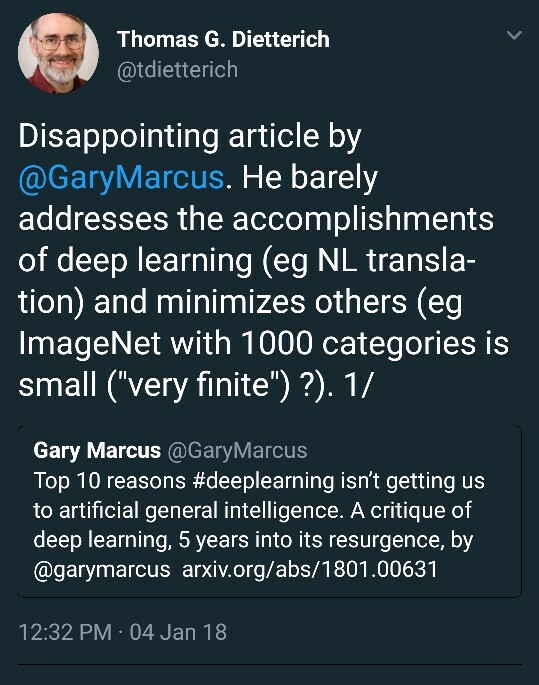 It is true that the things both of the highly respected individuals agree on are very fundamental problems with the current state of AI worldwide, but still Yann LeCun’s stand with respect to the debate topic was more acceptable as well as logical while Gary Marcus was criticized for certain remarks that he made even in his recent papers. I am not here to take sides, nor am I that experienced in the field to just throw irrational opinions around. 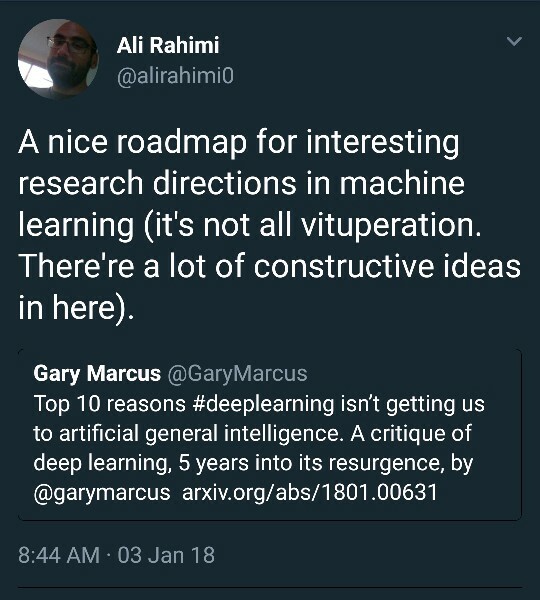 I am just a believer of the idea that AGI can be created one day in the future and deep learning is definitely going to have a vital role to play in a lot of its functionality. Companies especially like OpenAI inspire me as well as many others to believe that putting in hours into research and thinking about applications of AI will definitely yield amazing results that will revolutionize the way we live our lives. It would be something combining different fields of study like neuroscience, philosophy, mathematics, physics, computer science and many more that would together contribute in a masterpiece that would prove to be the best creation of mankind. 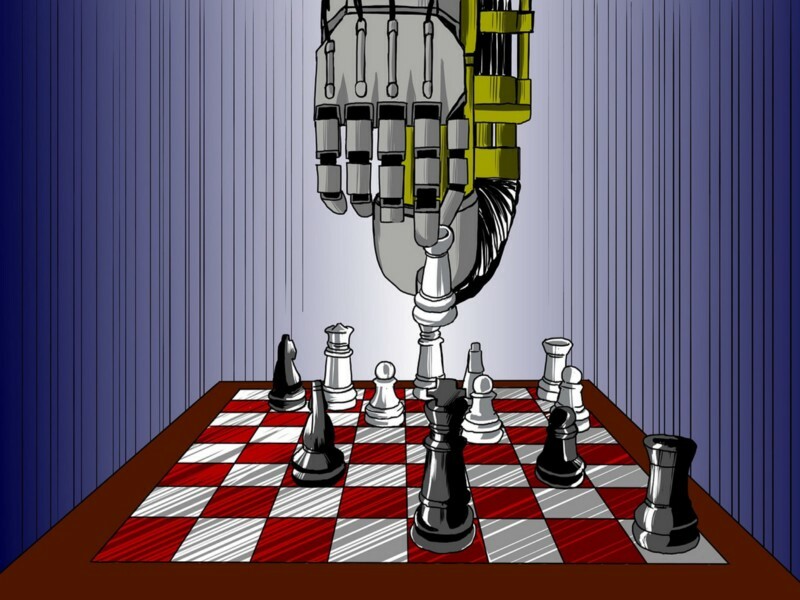 Indeed, the field of AI is split in various groups believing in different ways to approaching the solution to the problem of AGI and none of them seem incorrect. Again, I'm definitely not in some reputed position to be commenting on such great thought processes that had been born decades before I was born but consider these as thoughts of someone who has been closely following the works of pioneers of the field and believes that AGI can be created. These groups (with either symbolic or behavioral or any other approaches towards AGI) with their different ideologies and fair shares of drawbacks in their approaches need to be combined in a certain way that each one could nullify the other’s drawback, which again brings us back to the idea of cognitive synergy. You see, none of the ideas can be ignored totally. Every approach, every attempt, every single line of code written towards a successful implementation of AGI is important. At the same time, even developing principles of governance for usage of AGI by nations should be laid down as well as integrated into the machines so that they can’t be used for wrong purposes, which is exactly what Ethical AI is all about. There are several questions like this looming over the concept of AGI that need to be solved in order to actually achieve even more substantial and ground breaking outcomes in that area. Let’s hope that we’re all on the right track towards AGI and if not, atleast eventually find the right way towards the idea of humans and robots coexisting to make the world a better place to live for us as well as the generations to come! Bio: Raksham Pandey is a Data Scientist in the making... Electrified by AI... Passion for Deep Learning to solve problems that matter. Will AI kill us all after taking our jobs?